You know the love for fried chicken and beer is universal when White Americans appropriate it from black culture and put it into a country song. Singaporeans love fried chicken in nasi lemak. Taiwanese eat it as street food and powder it with chilli. Koreans have a shortened word, chimaek, which combines fried chicken (chikin) and beer (maekju), like Brangelina. And of course, Japanese have kaarage. (In fact, a specialty kaarage restaurant made it to our 10 Best Casual Restaurants in Singapore for Year-End Gatherings 2018.) Kindori at CHIJmes is just that: Japanese fried chicken and Japanese craft beers. Kindori is located at the no-frills, al-fresco area outside the yakiniku restaurant Renga-ya which is their sister restaurant. The wooden deck furniture and soft lighting convey a relaxed atmosphere, great for social night out and post-work drinks. While it would accommodate large groups, I’d suggest coming with no more than a party of 4 to preserve the chill vibes. They use fresh kampong chicken, picked for its deeply flavourful meat, which is marinated with Japanese yogurt, herbs and spices for three days, and deep-fried to a crisp golden-brown. We started with a basket of Chicken Cartilage because it’s not a common item on local menus. There is just enough batter to convey mouth feel, and as you can see from the picture, it’s not glistening with oiliness either. There’s a hint of salt and spices so it is good enough to eat it on its own. The Fried Chicken (4 for $16, 8 for $29) sounds expensive, but the pieces are sizeable, and again not oily on the outside. As you cut the chicken, you witness the juices flowing out. The kampong chicken is certainly firmer than what you might expect at fried chicken chains, but it is still enjoyable. This dish has a slightly heavier flavour than the cartilage. The chicken is accompanied by a choice of 3 house-made sauces out of 6 options such as Kare Curry, Wasabi Cream, Tangy Miso, Chilli Chilli, Basil Mayo and Umami Ume. Or you can opt for Magic Ikura Cream ($8), fresh cream topped with ikura, which is cool and light, a good cooling yin to the deep-fried yang of the chicken. For the sauces, the Kare Curry leans more towards the Indian variety than the sweet Japanese flavour. The Wasabi Cream could have been mistaken for savoury mustard. The standout dip for me is the Umami Ume for its tanginess. The acidity jazzes up the palette, and complements the chicken. The chicken would not be complete without beer. They have nearly 30 different types of Japanese beers on the menu. Popular favourites include a Kagua Blanc Yuzu ($18), a pale gold ale with a creamy head and citrusy yuzu notes, and a Koshikari Lager ($13), a clean and dry pilsner made from premium Japanese rice. Overall, I find this a nice place to unwind and have an unhurried chat with a friend, and if you come on a dry, starry night, they’ll open up the covers to have a truly al fresco experience. 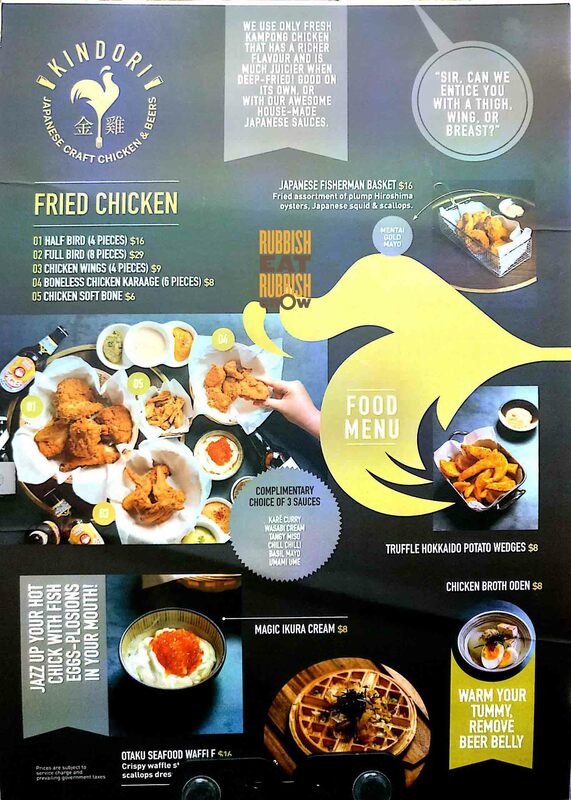 –Rang Mang Shokudo, Japan Food Town: Best Chicken Karaage in Singapore?